We should be absolutely alarmed by Trump’s firing of the FBI Director James Comey today. 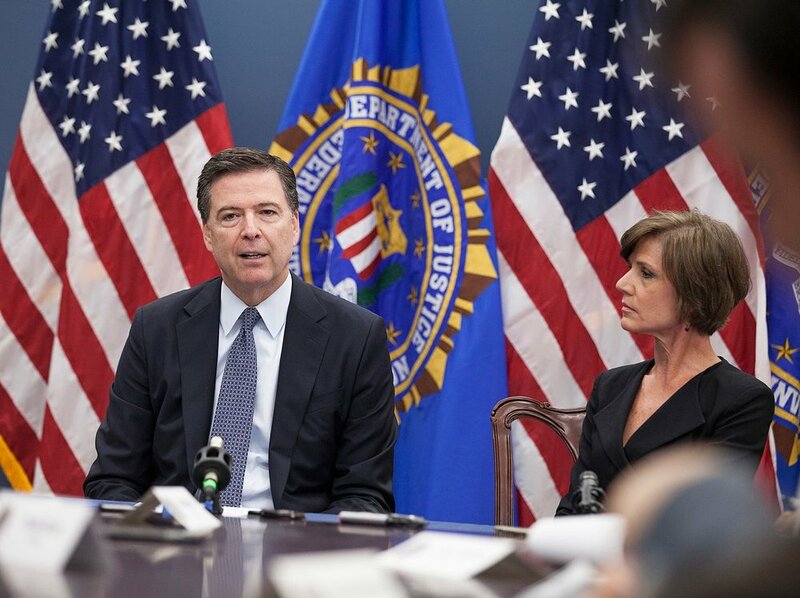 This is not to say that Comey will be missed – his misguided and defamatory reopening of the case against Hillary Clinton on 28 October 2016 greatly contributed to her loss in the election the following week. Furthermore, he was wrong not to disclose that the FBI was investigating the Trump campaign’s ties to Russia during the summer of 2016. But Trump’s firing of Comey is scary for two specific reasons: the first being that the statement from the Deputy Attorney General Rod Rosenstein argues that Comey was fired largely due to his mishandling of the Clinton investigation. This translates to: The Trump administration is unhappy with Comey’s decision not to press charges against Clinton, and therefore plans to instate a new director who could potentially reopen the case and file charges. But potentially even more important is the fact that this decision makes one thing extremely clear: where there is smoke, there is fire. Comey’s dismissal signals a serious fear within the administration that the FBI’s investigation into Russia and the Trump campaign is legitimate and that the discovery of concrete evidence is imminent. Reopening the case against Clinton would be nothing more than a distraction. Firing Comey is both a scare tactic and a scared tactic. Absolutely nothing more. Do not be fooled. The Trump administration is going to try to convince you that the Clinton investigation needs to be reopened and that her case needs to be the priority, above even the Trump campaign’s ties to Russia. It is going to attempt to distract you from the dismissal of National Security Advisor Michael Flynn due to his improper conversations with Russian Ambassador Sergey Kislyak and his subsequent lies to Vice President Mike Pence about what the two men discussed. It is going to try to distract you from the fact that the FBI concluded that Russian hackers did interfere in our election, including releasing emails from Hillary Clinton’s private email server and in releasing hacked documents from the Democratic National Committee. It is going to try to distract you from the fact that Republicans still standing behind Trump have chosen their party, time and time again, over the interests of their country. They have propped up an illegitimate president whose entire administration is tainted with deceit, inexperience, and paranoia. They are going to try to distract you with a new crisis in two or three weeks, because we are easily distracted creatures. We take one quick hit, are shocked for a short time, and then we are consumed by the next scandal. Trump’s track record now looks like this: a fired National Security Advisor, a fired FBI Director, a recused Attorney General, a fired Acting Attorney General, and a Deputy National Security Advisor. Do not be fooled: THIS IS NOT NORMAL BEHAVIOUR. This is a decline in democratic norms. This is alarming. This is smoke because there is fire. James Comey was by no means perfect at his job, but his removal is so unbelievably shady that it is difficult to put into words just how wild it is and is a testament to how little time Trump and his cronies must have put into it. Do not be fooled. Do not be distracted. Something buried is clearly trying to claw its way out, and Trump has done himself no favors by firing Comey.